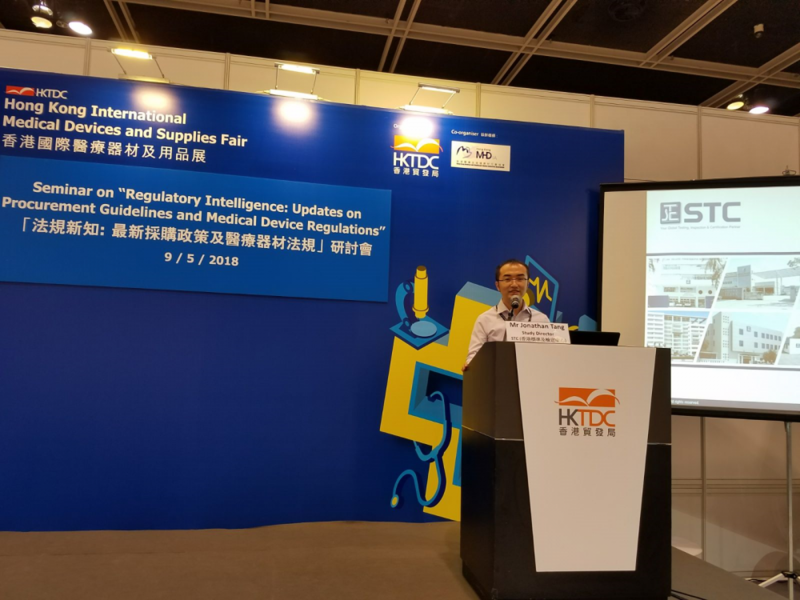 Hong Kong, May 9, 2018 – Embracing the latest enactment of European Medical Devices Regulation (MDR), Mr. Jonathan Tang, Study Director of STC, is sharing his insights of statutory improvements and system modernization today at the Hong Kong Convention and Exhibition Centre. 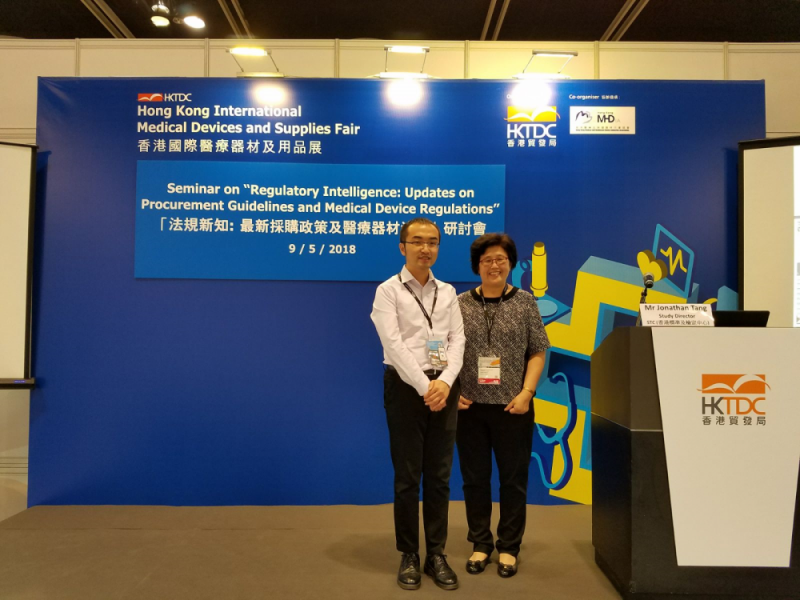 The seminar on updates on procurement guidelines and medical device regulations, organized in parallel with Hong Kong International Medical Devices and Supplies Fair, gathered thoughts and ideas of in-service personnel from industries of medical devices, technologies, supplies and healthcare products. “Effective on May 25, 2017, the new regulation primarily affects import of medical devices into the European Union. 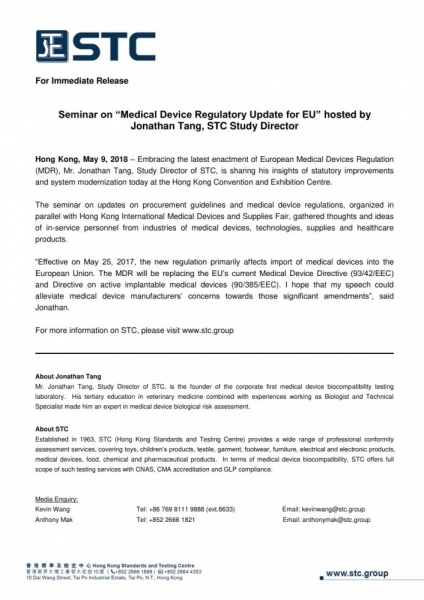 The MDR will be replacing the EU’s current Medical Device Directive (93/42/EEC) and Directive on active implantable medical devices (90/385/EEC). I hope that my speech could alleviate medical device manufacturers’ concerns towards those significant amendments”, said Jonathan. 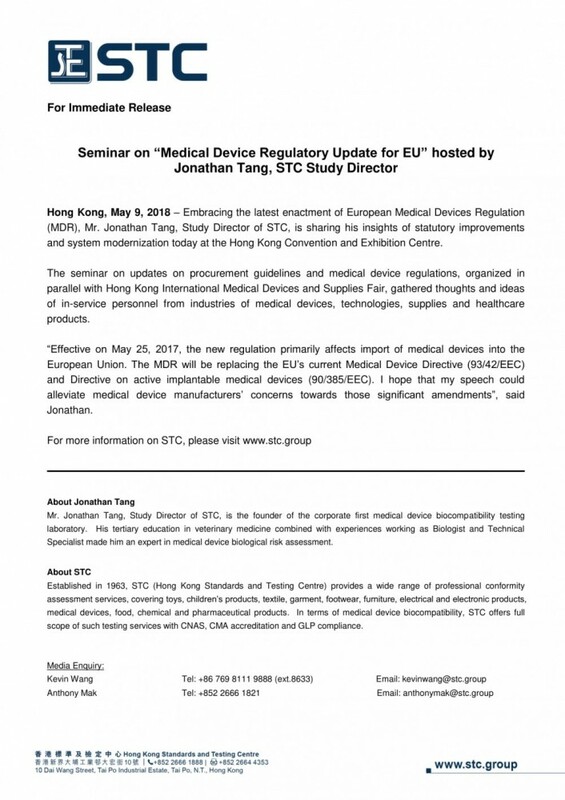 ------------ About Jonathan Tang Mr. Jonathan Tang, Study Director of STC, is the founder of the corporate first medical device biocompatibility testing laboratory. His tertiary education in veterinary medicine combined with experiences working as Biologist and Technical Specialist made him an expert in medical device biological risk assessment.